FIGMENT, the Emerging New York Architects Committee (ENYA) of the American Institute of Architects New York Chapter (AIANY), and the Structural Engineers Association of New York (SEAoNY) are excited to announce the winning design in the seventh annual City of Dream Pavilion Competition: Oculi by Austin + Mergold in collaboration with Maria Park (Cornell) and consulting engineers Chris Earls (Cornell) and Scott Hughes (Sillman). 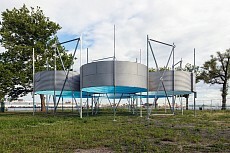 Pending approvals and fundraising, this temporary art structure will be assembled on Governors Island and open to the public for the summer 2018 season on Governors Island. It is the case that Ted Larsen, an American artist who made his debut solo exhibition in Europe at the Private View Gallery of Turin, was born in 1964, the same year as the famous text from Donald Judd, Specific Objects. 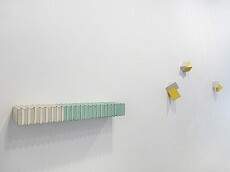 The new works exhibited here, created especially for the gallery spaces, presenting the artist's research, which springs precisely out of American minimalist art of those years. On display are a series of bas-reliefs, hybrids halfway between painting and sculpture, where Larsen comes away from the minimalist Dogma and retrieves a manual craft: each piece is in fact selected, cut and assembled according to the artist's own sensibility. On display are a series of bas-reliefs, hybrids halfway between painting and sculpture, where Larsen comes away from the minimalist Dogma and retrieves a manual craft: each piece is in fact selected, cut and assembled according to the artist's own sensibility. 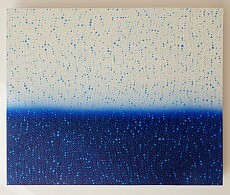 Reusing materials from old waste, such as sheet metal from cars and other materials, Larsen creates small paintings of composite geometries in which simple forms become complex agglutinations of polygons that expand and occupying space with their own visual projection and material footprint. Arranged in the environment, the works create a measured path and rhythmically punctuated by projecting volumes from the walls; among them are chromatic references that guide the observer from one work to another. Color is important and Larsen devotes particular attention to it; using it, at times, to build a visual route, both inside the work and throughout the installation; others works recall the visual sensations of memory: the dull colors of old cars and Formica dinner tables of Americans who, with the marks of their use, carrying the ideas and universal references of the past. 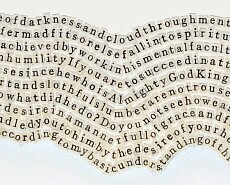 Another element embodied by these works is the oxymoron tension created in the titles like Awfully Nice or Same Difference or True Fiction (all 2016); with these semantic juxtapositions, with no bearing on what the work is, Larsen gives uniqueness to each work and suggests an intuitive understanding and a sense beyond the brain and logic. "I'm interested in slowing down the speed in which an image is viewed or consumed," says Maria Park, associate professor in the Department of Art. 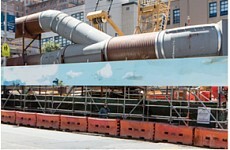 That was the aim of a mural installed last summer on a 150-foot temporary barricade adjacent to the construction of the Central Subway Chinatown Station on Stockton Street in San Francisco. Titled Sight Plan, the mural incorporates images of sky and clouds inspired by and painted from 150 photographs Park took over the last 10 years. It was commissioned by the San Francisco Arts Commission in partnership with the San Francisco Municipal Transportation Agency. Sunbathers enjoying a midday tan, friends goofing off in a pool, a few swimmers hanging by the rocks… these idyllic images take on an entirely different meaning when presented by painter William Betts. 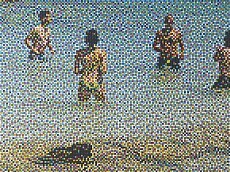 In his new show, SPLASH, up until mid-July at Margaret Thatcher Projects, Betts uses photography at a distance to capture his subjects at play, and then converts those images into pointillated works using a CNC machine. The result is a happy moment captured through a hidden lens, in which the artist calls into question everything we take for granted while out enjoying a sunny day. Phoning in from his home in sunny Miami Beach, Betts tells us about the illusion of privacy and mixing the mundane, the cheerful, with the sinister. William Betts’ current exhibition, entitled Splash, at Margaret Thatcher Projects offers a subtle peek at the limits of privacy, cased in the guise of celebrating summer fun in the sun. 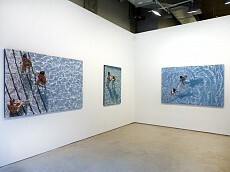 Adapted from security footage gathered at public pools and the like in the artist’s hometown of Miami, the paintings focus on the waterborne activities of everyday people, blissfully unaware that their fun is being caught on camera. Thus, the content of Splash hedges the line between ethereality and permanence, the sinister and the light-hearted, and voyeurism and celebration, in its dual embrace of Big Brother-like surveillance and the simple quotidian pleasures of the individuals at play in the paintings. “A work needs only to be interesting,” wrote minimalist sculptor Donald Judd in “Specific Objects.” Judd’s seminal 1965 essay comes to mind at Ted Larsen’s exhibition “New Works,” on show at Nüart Gallery. The New Mexico artist grew up in South Haven, Michigan and Santa Fe, and spent years painting color studies of landscapes and buildings before switching to sculpture. He hammers out elegant geometric forms from the grittiest of materials: steel that is salvaged from junked cars. 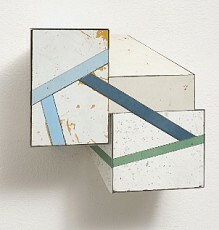 Larsen shapes these weathered bits of metal into patchwork patterns around substructures made from marine-grade plywood. In “New Works,” there are off-kilter cubes, simple wedges and ambiguous, undulating forms, all small enough to hold in your hands. They are mounted on the walls in a neat line, projecting out far enough to cast playful shadows beneath them. At David Mann’s solo exhibition Sympathetic Strings, the artist drew a rich visual and metaphorical connection between his art and sympathetic strings. Sympathetic strings lie beneath the strings touched by a musician. They’re activated through the strings’ vibration, and appear in various instruments, including, most notably, the sitar. 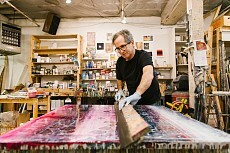 Mann uses these strings to visually create his multilayered paintings, and at the same time, his works pulsate with a unique energy and lyrical musicality, reminiscent of both nebulous forms under a microscope and the stellar vastness of space.